I have a Crock Pot Paleo Lasagna Recipe for you today. It’s one of my all-time favorite foods. It doesn’t get better than this folks! 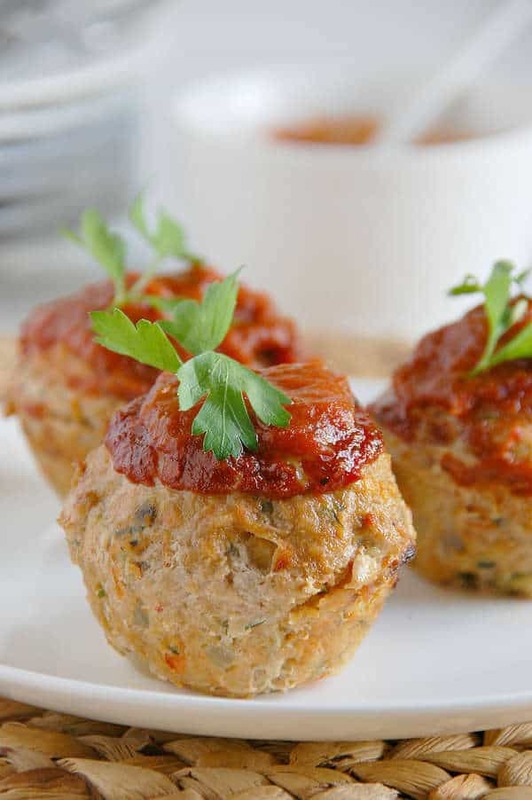 We have reinvented a classic dish to make it healthier and acceptable to maintain a Paleo lifestyle. 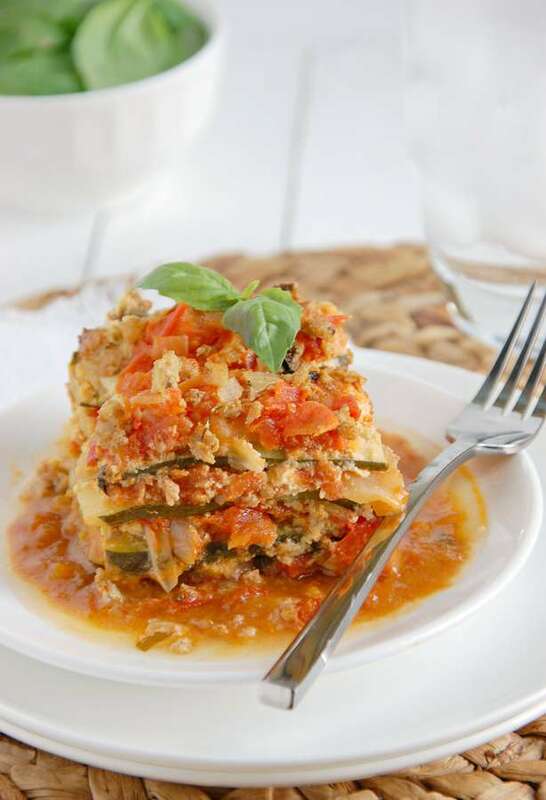 You no longer have to limit lasagna from your food list if you like to eat Paleo. 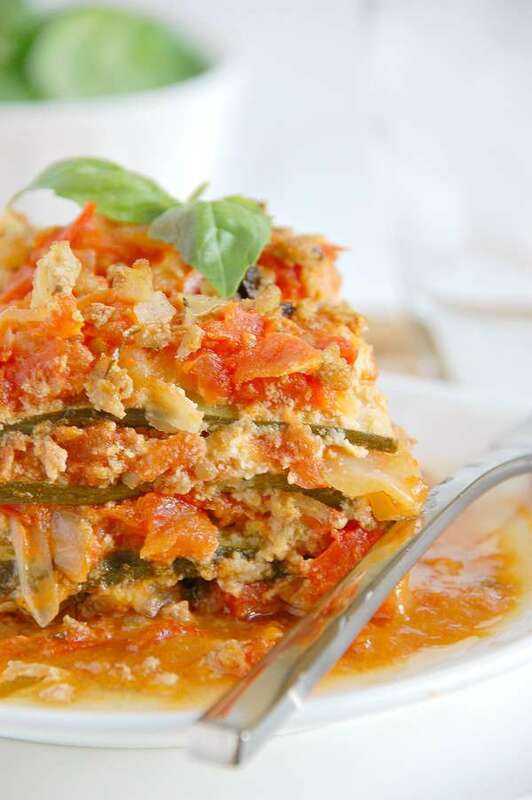 That is right – we have a Crock Pot Paleo Lasagna recipe for you to enjoy. I used thinly sliced zucchini for the noodles. It has 4 different layers…a homemade marinara, zucchini noodles, a creamy “cheese” layer, and a ground turkey layer with fresh basil. To make the “cheese” sauce I’ve pureed sauteed summer squash and onions with coconut milk and an egg. When cooked it forms a flavorful ‘ricotta’ like texture. Because the zucchini lets out so much water when cooked, you can either salt it and force some of the water out before cooking, or cook down the liquid after the lasagna has cooked. I found that removing the liquid from the crock-pot after the lasagna was cooked (I used a turkey baster which worked very well) and quickly reducing it in a wide pan made a creamy, super flavorful sauce which made the lasagna extra good. Although this Crock Pot Paleo Lasagna recipe is a little bit more involved and time-consuming, it was very much worth it! This recipe tastes wonderful, is healthy, and is a great way to eat lasagna while maintaining a Paleo lifestyle. It is so good, our family just can’t wait to make it again! We hope you can enjoy this recipe as much as we did! Let us know if you have tips or suggestions and what you think of our recipe! Enjoy! 9 Paleo Ground Turkey Recipes You’ll Want to Eat! 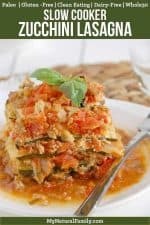 A paleo crock pot lasagna recipe with four delicious layers: a homemade marinara, zucchini noodles, a creamy “cheese” layer, and a ground turkey layer with fresh basil. Heat the olive oil in a large saucepan over medium/high heat. Add the onion and salt and saute for 2 minutes. Add the garlic and saute for 30 seconds more. Add the tomatoes and honey and reduce heat to medium. Let the sauce cook down for about 20 minutes, or until no longer watery and slightly thick. Check seasonings and add more salt, if needed. Heat the olive oil in a saute pan over medium/high heat. Add the ground turkey and break apart with a spatula. Cook the turkey for 2 minutes then add the onion, salt and pepper. Continue cooking until turkey is cooked through (make sure it has been broken up into small crumbles) and the onion is soft. Remove the pan from heat and toss the fresh basil into the mixture. Heat the olive oil to medium in a small saucepan. Add the chopped onion, summer squash, salt, and garlic to the pan and saute for about 3-4 minutes, until the onion is translucent. Do not brown. Add 1/4 C. of the coconut milk to the pan and bring to a boil. Simmer for 2 minutes, or until more than half of the liquid is absorbed. Place the mixture in a blender with the remaining 1/4 c. coconut milk and puree until very smooth. Add the egg and puree until well blended. Lightly grease the inside of a crockpot. Cover the bottom of the crockpot with about 3/4 C. of the marinara sauce, spreading it out evenly. Place about 5 zucchini ‘noodles’ side by side over the marinara sauce. Spoon a layer of the ‘cheese sauce’ over the zucchini noodles (about 1/2 C). Sprinkle about 1/2 heaping c. of the meat mixture over the sauce. Spoon about 1/2-3/4 C. of the marinara sauce evenly over the meat mixture. Repeat this layering process until you have made 5 layers (zucchini, sauce, meat, marinara) ending with the marinara sauce. After 1 1/2 hours, remove the lid. Using a turkey baster or a ladle, remove all excess liquid that has pooled in the crock pot (the zucchini will let off quite a bit of liquid) and place it in a shallow frying pan. Bring the liquid to a boil and simmer for about 5-7 minutes, or until reduced into a thick, creamy sauce. Pour the sauce over the top of the lasagna in the crock pot and serve. I’m so glad you asked. I don’t know how that got changed in the recipe but somehow it got changed from summer squash to zucchini in the cheese sauce so I changed it back. I’m sure that will help a lot of people. Thank you! I figured it out when I read through the previous pages. I tried it this weekend and very much enjoyed it! Didn’t make the sauce at the end so not sure if that would have made it even better. Leftovers were great tonight! So good to hear. I’m glad you liked it! I just made this and WOWOWOWOWOWOWIWOW it’s AMAZING. I’m holding back from eating the whole pot. It’s truly delicious thank you! I’m actually not paleo but I’m gluten free and dairy free so this recipe worked. I used a non soy based plant mozzarella and it tasted just like real cheese! I’m so glad you liked it! So good to hear. I love how it has so many veggies and is so comforting, yet so light at the same time. I gave this recipe 3 stars because it was good (not great), but the time to make it wasn’t worth the result to me. As others have mentioned, I noticed while cooking there wouldn’t be much sauce, so I added to that portion of the recipe. The cheese sauce – honestly, I don’t get it. It tasted EXACTLY like what it’s made from : yellow squash, onions, and egg. It’s just more vegetables in an already very vegetable dish. I should mention, I’m not a lasagna fan (real lasagna) and I did think this was better than the real stuff. My family (who all love lasagna) said this dish was OK – good, but not great. I don’t think I’ll make it again because of the time and effort (time I am short on!). I get just as good of a result baking eggplant and tossing on cooked ground beef or turkey and a quick homemade sauce (organic canned tomato sauce, garlic) in a fraction of the time. I must say I pretty much agree with you. I personally think lasagna of any kind takes too long. I made this all fancy so it would look good for pictures, etc. – but in real life most of the time I just throw the ingredients in the crock pot, mix it up and forget the cheese sauce. Made this yesterday, and I clearly went wrong somewhere. It tasted fantastic, but the zucchini was still firm (I cut each in 6-7 pcs) and the rest was like soup (even after ladling out what I could). We let it cook longer and then just heaped it into the plate and scooped up! Sounds like the zucchini was a bit thick, but that shouldn’t have mattered too much. Maybe the temperature of your crock pot is different from mine? Any one else have any other ideas? I’m confused, did you make this in a crockpot or the instant pot? I made it in the crock pot, or you could make it in the Instant Pot on the crock pot setting. I have made this a few times now. I love how healthy it is. And the cheese sauce… yum! Although my kids still prefer the meat version I like to throw this in every now and again to mix it up. This recipe blew me away. The flavor was incredible. Love the idea of reducing the liquid produced from the zucchini. So smart. I actually had some trouble reducing quicky and decided to add some tapioca flour to produce more of a gravy. Regardless it was excellent and I am elevating this to the top of my list of favorite recipes! Awesome! I am glad you like as much as we do! This taste great however i didnt have nearly enough marinara to do 5 layers and at the end i didnt have any extra juice?!?! Cant figure out what went wrong! The recipe calls for 7 cups of tomatoes or about 10 medium sized ones. If you prefer more sauce just add more to it. I am allergic to coconut. Seems like coconut/coconut oil is a staple to Paleo. Having trouble finding recipes without it. Any suggestions for substitutes? Cashews are not nuts, so nut allergies typically don’t apply. A cashew is most definitely a nut and nut allergies do apply. I am allergic to tree nuts and if someone gave me cashews , I would not be a happy camper! Would it be a problem to substitute almond milk for the coconut milk? I think it should be fine, if you try it let us know how it goes. We love to make zoodles (our name for zucchini noodles) and lasagna is one of my favorite ways to use them, but having gone dairy free the “cheese” part has been something of a challenge. I’ve cheated in the past and used a bit of real cheese on the top while mixing a cashew cheese with spinach to make a ricotta like layer. I can’t wait to try your cheese sauce idea, but have one question…. I use coconut milk in some things, but find that the coconut flavor is too strong in others. Have you tried using any other dairy-free milk? I am allergic to soy, so that one is out, but any of the others could work for us. Just wondered your thoughts on this. Maybe the coconut milk in the can is less coconutty? I use coconut milk a ton for dairy free recipes in our family and I have only used Natural Value canned coconut milk so I don’t know about the others but it doesn’t taste like coconut at all. All my kids eat it fine and don’t complain about it, which really surprises me because I can taste a difference. It’s not gross or anything. It’s just not the same. Hope that helps . . . So happy to find your website! I’ve been looking for Low Carb slow cooker recipes. This looks fantastic! Must try soon. Thanks! This looks amazngly delicious! I love cheese, so I am curious how this will taste without traditional cheese. It sounds so healthy and fresh and light for a lasagna, cant wait to try it. I LOVE the looks of this cheese sauce! I am so intrigued! This will be our third time making this outstanding dinner tonight. Love everything about it, especially the fact that dinner is already done for tomorrow & will be just as delicious! Delicious! However, I did use an organic marinara sauce. I will try the recipe for marinara sauce next time. This was amazing!! My family loved it! Do you think I could bake this in the oven next time? If so what temp and how long? The reason I ask is because we LOVED it so much that I would like to double the recipe but my crockpot isn’t big enough for a double recipe! Thank you for a wonderful dinner! So glad you liked it! You could definitely bake it in the oven. I would suggest cooking it at 350 degrees for 45-60 minutes, then reducing the sauce after baking. I rarely comment on websites, however this recipe is SO AMAZING I literally can not stop talking about it! I have tried so many recipes looking for a replacement for gluten lasagna, this is it! I fed it to non-Paleo family and they loved its flavour and were surprised it was Paleo. Thank you, thank you, thank you:). So awesome to hear! I’m glad you like the recipe. Please come back for more great recipes. This looks outstanding. We just got home from the store with the ingredients to make it and now I’m not sure we got the right coconut milk. We bought Silk Original (unfortunately we messed up, we usually get unsweetened) . Is it canned coconut milk, “original” or unsweetened? Thank You. We can’t wait to try it. I always use Natural Value canned coconut milk. Oh my goodness, that looks amazing! I’m pinning this to my Low Carb board right now! This sounds fantastic! That “cream sauce” sounds divine. Thanks for sharing this at the Friday Frenzy. Guilt free lasagna, sign me up! Your recipe looks crazy good, Rebecca! Pinned and sharing on social media.